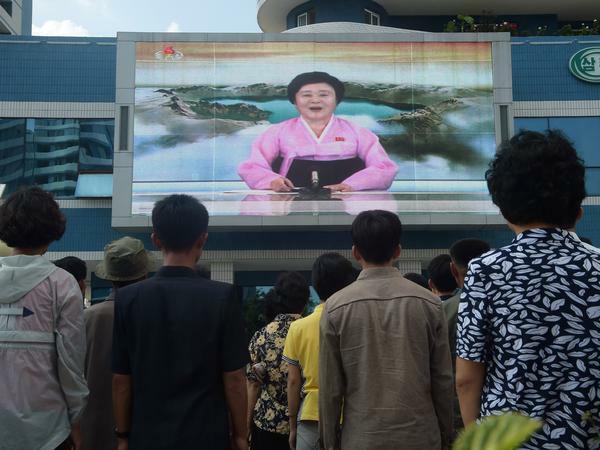 North Koreans watched a video screen in Pyongyang showing Korean Central Television news presenter Ri Chun Hee as she announced that the country had successfully tested a hydrogen bomb on Sept. 3, 2017. "North Korean TV news nowadays has mainly been about rice-planting season," says Chad O'Caroll, who monitors North Korean state media for his service, NKNews.org. "So it's a huge, huge difference. Seriously." Korean Central Television, the state broadcaster, is the only channel North Koreans get, and it's showing the farmers at work, he says. This leaves North Koreans largely in the dark about all the rushed diplomacy happening in the lead-up to June 12. "You can keep 25 million people completely in the dark. So the propaganda apparatus and the way the North Korean government tells different things to its people, and also restricts them from hearing things, is one of the things I was most interested in," says Martyn Williams, who records and watches North Korean state television every day from satellite TV, as part of his blog, North Korea Tech. When Kim met South Korean leader Moon Jae-in in April, the world watched live, Williams says — except North Korea. "It was kind of amazing that we were watching all that live, and they had absolutely no access to any of that," he says. "But of course that changed after the summit." The day after, some summit footage aired on Korean Central Television. And a few days later, after meetings between Kim and Chinese President Xi Jinping, North Korean state TV put together a half-hour documentary with highlights from those meetings and the Moon summit that were deemed acceptable for the public viewing. This kind of information control, Williams says, gives the regime flexibility in case things don't work out. "There's a big risk for the North Koreans in telegraphing too much to their own people ahead of time," he says. "So what they do is to wait until afterwards." North Koreans do know that a summit with the U.S. leader is coming up, but little beyond this. O'Carroll says the lack of coverage is normal for North Korea, but there has been one significant change: the tone toward Pyongyang's traditional enemy, the U.S. Previously, he says, "The rhetoric was very angry, very anti-America, and that almost disappeared after Trump accepted that proposal for the summit." The softer tone toward America is seen not just in newspapers and on television, O'Carroll says, but even in citizen-to-citizen propaganda — North Korean leaflets that are dropped or blown into the southern side of the border. "You used to find these things with cartoon depictions of Donald Trump being stamped on the side of the curb, blood everywhere, or him having his toes sucked by the South Korean president — really pretty crude stuff," he says. Lately, those depictions have been replaced by more benign images. "Some of them, you'd even have thought may have come from South Korea — like cartoon designs showing the Olympics mascots," he says. Those are from the February Winter Games — where the two Koreas fielded their first joint team. If this and other North Korean propaganda is any guide, signs of peace are appearing. NPR News Assistant Se Eun Gong contributed to this story. The proposed summit between the U.S. and North Korea is dominating headlines around the world - except in one place, North Korea itself. Our Seoul correspondent Elise Hu has a look at what North Koreans are learning in advance of the Singapore summit. ELISE HU, BYLINE: The summit was off. Now it's likely back on. And the talk about it plays on every channel in America. UNIDENTIFIED REPORTER #1: President Trump has spent weeks hyping his upcoming summit with North Korea. UNIDENTIFIED REPORTER #3: We've seen the president so eager for this meeting to happen. HU: But what's dominating the news in North Korea? CHAD O'CARROLL: North Korean TV news, the last few days, has mainly being about rice planting season. So it's a huge, huge difference. HU: Chad O'Carroll monitors North Korean state media for his service nknews.org. HU: What about rice planting season, I asked. O'CARROLL: Well, now's the time. And they're showing, I guess, the farmers are at work. HU: This leaves North Koreans largely in the dark about all the rushed diplomacy happening in the lead up to June 12. That's the scheduled date for a Trump-Kim summit. While a North Korean envoy met this week with Secretary of State Mike Pompeo in New York, North Koreans saw none of that in their regular 5 and 8 pm national broadcasts. Martyn Williams knows. He records and watches state television every day. And state television is the only TV news North Koreans get. MARTYN WILLIAMS: You can keep 25 million people completely in the dark. So the sort of propaganda apparatus and the way that the North Korean government tells different things to its people - and also restricts them from hearing things - is one of the things I was most interested in. HU: Williams says when Kim met with South Korean leader Moon Jae-In in April, the world watched live while North Koreans did not. WILLIAMS: It was kind of amazing that we were watching all that live, and they had absolutely no access to any of it. But, of course, that changed after the summit. HU: A few days after that summit and meetings with Chinese leader Xi Jinping, state TV put together a half-hour documentary that place highlights they deem acceptable for the populace. This kind of information control, Williams says, gives the regime flexibility in case things don't work out. WILLIAMS: There's a big risk for the North Koreans in kind of telegraphing too much to their own people ahead of time. So what they do is they wait until afterwards. HU: North Koreans do know that a summit with the U.S. leader is coming up. But that's about it. UNIDENTIFIED REPORTER #4: (Speaking Korean). HU: This is a North Korean state TV reference to the June 12 date and thanking South Korea for its effort in making things happen. Chad O'Carroll says the lack of coverage is normal in North Korea. But what has changed in North Korean news lately is its tone toward its traditional enemy the U.S.
O'CARROLL: The rhetoric was very angry, very anti-America. And that almost disappeared after Trump accepted that proposal for the summit. HU: O'Carroll says the softer tone toward America is seen not just online, in newspapers and on television but even on the citizen-to-citizen propaganda level. He's talking about leaflets that are often dropped over or blown into the southern side of the border. O'CARROLL: They used to find these things with cartoon depictions of Donald Trump being stamped on the side of a curb, blood everywhere, or him having his toes sucked by the South Korean president - really pretty crude stuff. HU: But that anti-American propaganda has now taken a more peaceful tone. O'CARROLL: Some of them you would even have thought may have come from South Korea, like cartoon designs showing the Olympic mascots. HU: Those are from the February Winter Games in which the two Koreas fielded their first ever joint team. If this kind of North Korean propaganda is any guide, signs of peace are appearing. Elise Hu, NPR News, Seoul. (SOUNDBITE OF PENSEES'S "LUNAMOTH") Transcript provided by NPR, Copyright NPR.